← Kenwood TS-520 – what a great rig! SDR Radios are the latest and greatest things to come along in Ham Radio since solid state was invented. Ok, well that may be a stretch, but it certainly has made some incredible advances in SWL and Ham radio. Thanks to the ingenuity of some super smart people we can all enjoy an inexpensive alternative to some of the VHF and UHF dongles out on the market. 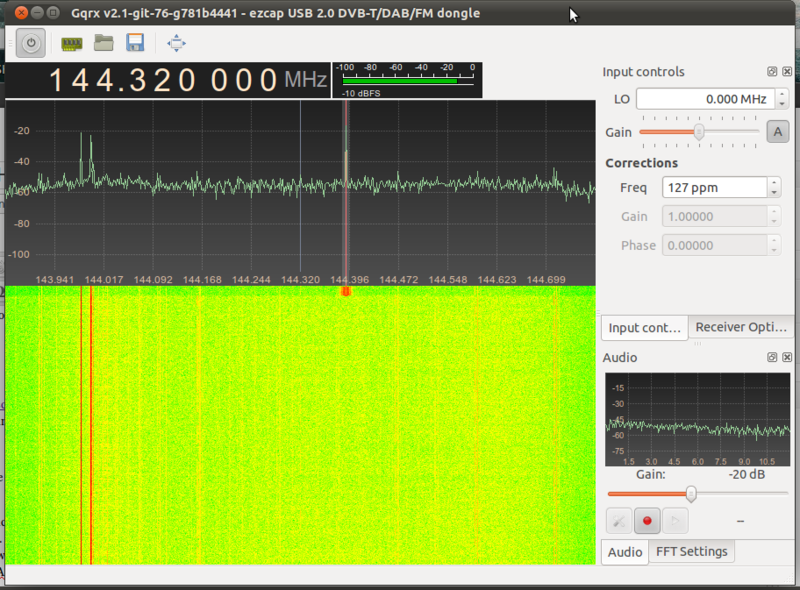 Interesting enough a product that was meant to be a DVB-T, DAB and DAB+ tuner actually makes a great SDR Radio! There is a specific model chipset that is required to utilize the SDR tuner. It requires the e4000 tuner and the Realtek RTL2832 chipset. Unfortunately on my first try I received an upgraded DVB dongle that had a newer chipset that is not compatible with any SDR software. I was a little disappointed at first but I am using it for local ATSC channels for my PC so no big loss. I later found that Reddit maintains a list of compatible tuners. I ended up ordering a Newsky TV28T from Aliexpress.com which had the correct tuner/chipset and worked perfectly. I was surprised at how well it actually worked, I was receiving the NOAA weather radio broadcast, our local airport tower communications, APRS, neighborhood weather stations, and some FRS chatter. I originally wanted to use it for the reception of Amateur radio satellites/Cubesats which I am sure it will work well for but I haven’t had a chance to try it. Pretty amazing stuff considering it was less than $30 shipped. 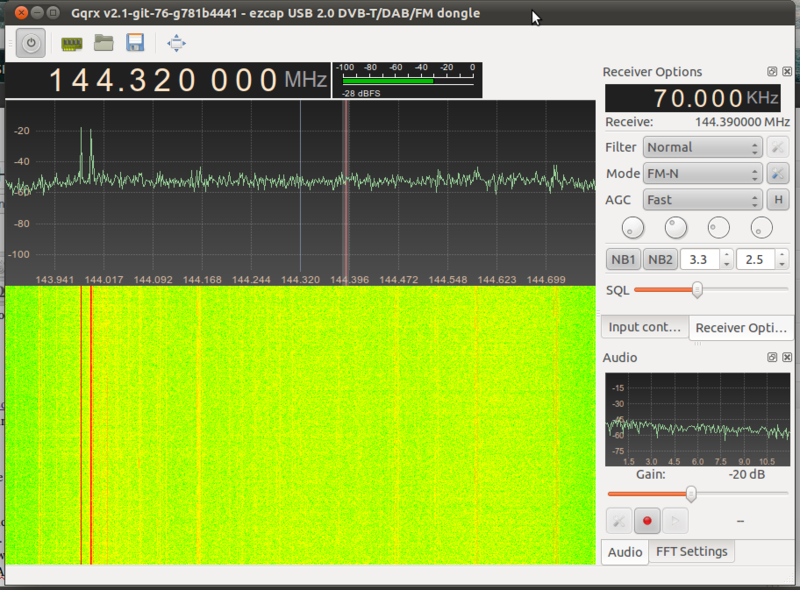 Using the Windows software was the easiest way to get this SDR to tick. I enjoy using Linux but I was already used to using HDSDR and wanted a “quick fix” for my SDR listening enjoyment. Fortunately there is a fairly straight forward way to use Windows and the DVB dongle. I followed instructions such as those on the Ham Radio Science Blog and was up and running in no time. I won’t list all the steps here for the Windows setup as this webpage does a good job at outlining all the steps. After using the Windows setup for a while I decided to give the Linux offerings a try. It wasn’t that all that difficult after putting all the pieces together. GNURadio Package – I highly recommend the build script to help install the dependencies and compile all the necessary components. Also see an excellent post on how to use BackTrack and a offline package. Important Notes: My DVB dongle was off-frequency by 21khz but the ExtIO plugin for HDSDR makes it easy to correct for the frequency error. You can right-click the ExtIO button on the HDSDR interface to bring up the Tuned frequency adjustment. Left-clicking the same button brings up the normal ExtIO options. On the Linux side of things GQRX has an option to adjust the ppm value for frequency adjustment. To access the option click View, then Input Controls on the menu bar. A Tab will appear under the Squelch control labeled Input Controls. From there you can correct for frequency errors. I used my APRS signal and the built-in 1200 AFSK Decoder dial it in. Posted on June 12, 2012, in Experimentation, SDR, Software. Bookmark the permalink. Leave a comment.